Home Headlines US mid-terms: What are the claims of voter suppression? Claims of voter suppression have erupted ahead of the mid-term election in the US, with critics saying tougher identification and registration requirements in several states are designed to limit participation. There have been allegations of voter suppression in previous elections but the claims now are more severe, experts say. Many states, the majority of them governed by Republicans, have put in place new legislation, saying they are needed to prevent rampant voter fraud. Opponents to the measures say such a threat is extremely low and argue that their true goal is to prevent specific groups – such as minorities, who tend to favour Democrats – from voting. “They’re occurring in places where Republicans currently have partisan control but they’re concerned they might lose it,” says Vanessa Williamson, a governance studies fellow at the Brookings Institute in Washington, DC, who has written about the topic. Since the 2010 election, 24 states have introduced new restrictions. But ahead of the November vote, attention has mainly focused on three states for different reasons. Some 1.5 million ex-felons will not be allowed to vote as the state is one of few to bar ex-offenders from voting unless the governor gives them a pardon. That number reportedly included almost 500,000 African-Americans, who traditionally vote Democrat. The disenfranchisement law was implemented by Republican Gov Rick Scott, who won two gubernatorial races by a margin of just 60,000 votes. He is now running for the Senate. Mr Scott reversed a policy that had restored rights to tens of thousands of felons, blocking tens of thousands others from getting their chance to vote. The race for governor is a tight one between Democrat Andrew Gillum, who wants to become the state’s first black leader, and Republican Ron DeSantis. Mr Scott is facing Democrat Bill Nelson for a Senate seat in another highly contested fight. On election day, voters in Florida will also be asked to decide whether to restore voting rights to ex-felons in the state. It is a change that could have a significant impact in a key swing state with 29 electoral votes – in 2016, Donald Trump won over Hillary Clinton by just 112,000 votes. More than 50,000 voter registration applications – 70% of them from African-Americans, according to the Associated Press – have been put on hold due to alleged problems with identification information. That is because of the “exact match law” that requires the application to have exactly the same information existing on the voter’s driving licence or Social Security databases. People whose applications are now pending have been required to confirm their identities, and that is the source of confusion. Georgia’s Secretary of State, Brian Kemp, the Republican candidate for governor, has denied any attempt of voter suppression – in his post, he oversees the election process. His campaign says those affected can solve any problems before or on election day. The state’s race is one of the most fiercely contested in this election. Democratic candidate Stacey Abrams is hoping to become the country’s first black female governor, and says the new law, passed last year, is designed to “make it harder” for people to vote. There have also been reports about the cancellation of more than 100,000 registrations last year of people who have not voted in recent elections and complaints over the closure of more than 200 polling stations across the state in the last six years. A new law demands voters show identification that provides their name, date of birth and residential address. That requirement has a special impact on thousands of Native Americans who live in reservations with no street address – they have post office boxes instead. Earlier this month, the Supreme Court upheld the law, signed by Republican Gov Doug Burgum in 2017. That means that the requirements now are different than in the primaries held just months ago, which could confuse some voters. Supporters of the new rules say the legislation is a way to prevent voter fraud, as the state does not require any prior registration – people can vote by showing their ID at polling stations. They add that individuals affected can contact their county’s 911 co-ordinator to have an address assigned. Critics, however, say the process is costly and not so simple. The changes could have a decisive impact on the Senate race. Democrat Heidi Heitkamp, who is facing Republican Kevin Cramer, won her seat in 2012 by fewer than 3,000 votes. Tensions have also erupted in North Carolina and Kansas over tougher ID rules. How is it seen across the country? Requirements vary across the US, where there has been an effort to encourage people to register and vote. 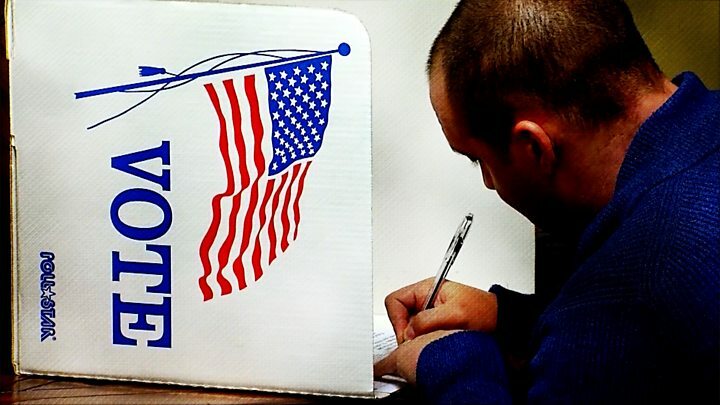 Many states allow voters to cast an early vote or register at polling stations even on election day. Research by the nonpartisan Pew Research Group released this week suggested that two-thirds of the public said “everything possible should be done to make it easy for every citizen to vote.” Only a third said citizens “should have to prove they want to vote” by registering in advance. “Republicans, however, are far more likely than Democrats to support removing people from voter lists if they have not recently voted or confirmed their registrations,” the report said, adding that there were more people concerned about eligible voters being barred from voting than those ineligible casting ballots. How is voting in other countries?